Without officially resigning, embattled Gwinnett County Commissioner Kevin Kenerly voluntarily suspended himself until the charges have been resolved or until Kenerly’s term ends at the end of December. Kenerly is under indictment for allegedly accepting $1 million in bribes related to County land purchases and failing to disclose a relationship with a private developer seeking rezoning from the County. Kenerly was facing increasing criticism from voters. James Bell, co-founder of the Georgia Taxpayers Alliance, said Kenerly’s presence on the commission was a distraction. Fellow alliance member Ron Williams agreed. The AJC reports that Suwanee wants the last 4 acre residential holdout in the Suwanee Gateway on four-lane Lawrenceville-Suwanee Road to be preserved as park land to save old oak trees and project a positive image for the commercial corridor off I-85. The problem, Suwanee does not have any intention to purchase the property. Instead, Suwanee development staff recommend denying a rezoning application and special use permit for the property that would allow a gas station and car wash. Such action would require the elderly owners to permanently maintain the property as residential, even though they no longer live there. While city staff oppose the rezoning, Mayor Dave Williams supports rezoning of the property, but has not made a decision on the special-use permit to allow the car wash. In 2008, City of Sandy Springs rezoned 8 acres of land near the intersection of Long Island and Lake Forrest drives to allow Holy Spirit Preparatory School to build a football and soccer stadium and a school administrative building. Long Island Neighborhoods Coalition sued opposing the rezoning and the construction. Last week, Fulton County Superior Court Judge Kimberly Esmond Adams upheld the City’s rezoning and dismissed the neighborhood’s complaint. The neighborhood has 30 days to seek an appeal. Atlanta City Council approved a new zoning ordinance (SPI-9) for Buckhead covering a significant part of the Buckhead commercial area generally west of Piedmont Avenue and north of Pharr Road. 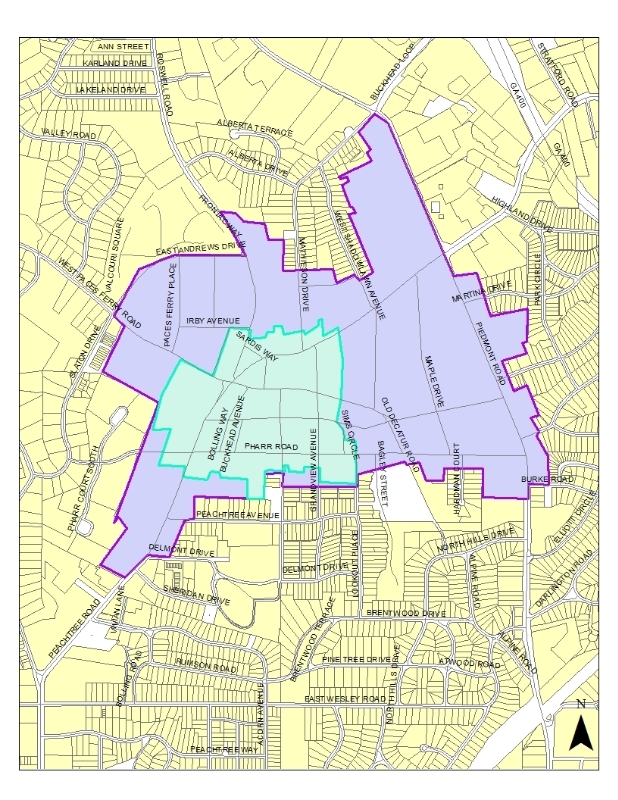 According to the Buckhead Community Improvement District, the new zoning ordinance positions Buckhead to become “a more walkable, urban community enriched with public art and parks, wide sidewalks, greenspace, transportation options, and outdoor dining, all designed to have international appeal.” The ordinance defines street treatments, facades, sidewalk widths, signage, greenspace, and other public elements intended to create a cohesive feel to the community and help developers position their developments with consideration of public space. You can review the approved ordinance here.